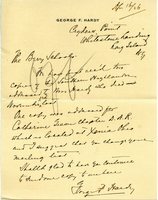 W. K. Ballantyne writes to ask Miss Berry if he could have some copies of an issue of Southern Highlander that include information on her work. He wants to distribute them to the children of a Boys and Girls home. 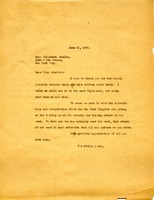 He thanks her for her wonderful work. 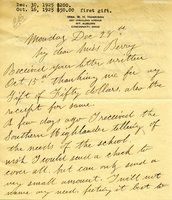 Mrs. Jane Bruere writes to Martha Berry thanking her for the gift of a copy of the Southern Highlander as well as a copy of The Sunday Lady of Possum Trot. Harrison sends a second contribution, having read of the school's needs in a recent issue of the Southern Highlander.